Mother Teresa, Agnes Gonxha Bojaxhiu, was born in 1910 in Skopje. Her father died when she was eight years old. Gonxha's religious formation was with the Jesuit parish of the Sacred Heart in which she was very involved as a youth. Gonxha left her home at the age of 18 to join the Sisters of Loreto, in Ireland. She received the name Sister Mary Teresa. In 1929, she left for India, arriving in Calcutta, and taught at St Mary's School for girls. Sister Teresa made her Final Profession of Vows in 1937, becoming, as she said, the "spouse of Jesus" for "all eternity." From that time on she was called Mother Teresa. She continued teaching at St. Mary's and in 1944 became the school's principal. In 1946, during a train ride from Calcutta to Darjeeling for her annual retreat, Mother Teresa received her "inspiration, her call within a call." On that day, in a way she could never explain, Jesus' thirst for love and for souls took hold of her heart. In 1948, she dressed for the first time in a white, blue-bordered sari and passed through the gates of her Loreto convent to enter the world of the poor. She went for the first time to the slums, visited families, washed the sores of children, cared for an old man lying sick on the road and nursed a woman dying of hunger and tuberculosis. She started each day with communion then went out, rosary in her hand, to find and serve Him amongst "the unwanted, the unloved, the uncared for." After some months, she was joined by former students. Mother Teresa sent her Sisters to other parts of India. She opened a house in Venezuela, followed by foundations in Rome and Tanzania and, eventually, on every continent. 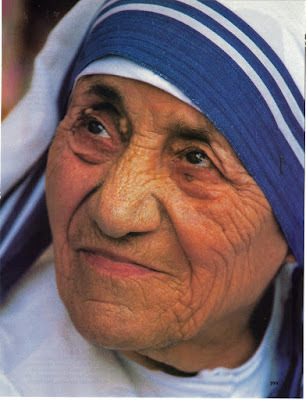 Starting in 1980 and continuing through the 1990s, Mother Teresa opened houses in almost all of the communist countries, including the former Soviet Union, Albania and Cuba. Mother Teresa received many awards, beginning with the Indian Padmashri Award in 1962 and the Nobel Peace Prize in 1979. She received both prizes and attention 'for the glory of God and in the name of the poor." In addition to her extraordinary love for the poor, Mother Teresa service was marked by experiences of deep, painful and abiding feelings of being separated from God, even rejected by Him, along with an ever increasing longing for His love. She called her inner experience, the darkness. The "painful night" of her soul started around the time she started her work for the poor and continued to the end of her life. In 1997, Mother Teresa died. She was given a state funeral by the Government of India and her body was buried in the Mother House of the Missionaries of Charity. Mother Teresa's Sisters numbered nearly 4,000 members and were established in 610 foundations in 123 countries of the world. Mother Teresa left a testament of unshakable faith, invincible hope and extraordinary charity. Her response to Jesus' plea, "Come be My light," made her a "mother to the poor," and a symbol of compassion to the world.